Touch-A-Train Event #1, hosted by the Maine Eastern Railroad on April 12th, was just about perfect in every manner possible. Maine Eastern opened its historic FL9 locomotive #488, lounge-buffet Penobscot Bay, coach Ash, a newly refurbished caboose, and a historic snowplow to the general public, on the most beautiful day of the year to date. The Wiscasset, Waterville & Farmington Railway Museum brought their Turner Centre Dairying Association #65 refrigerator car and displayed it on a length of two foot gauge track, filled with historic information. In the Penobscot Bay, the WW&F sold steam restoration tee-shirts, while the Boothbay Railway Village welcomed visitors with Thomas the Tank Engine temporary tattoos and information about their services. 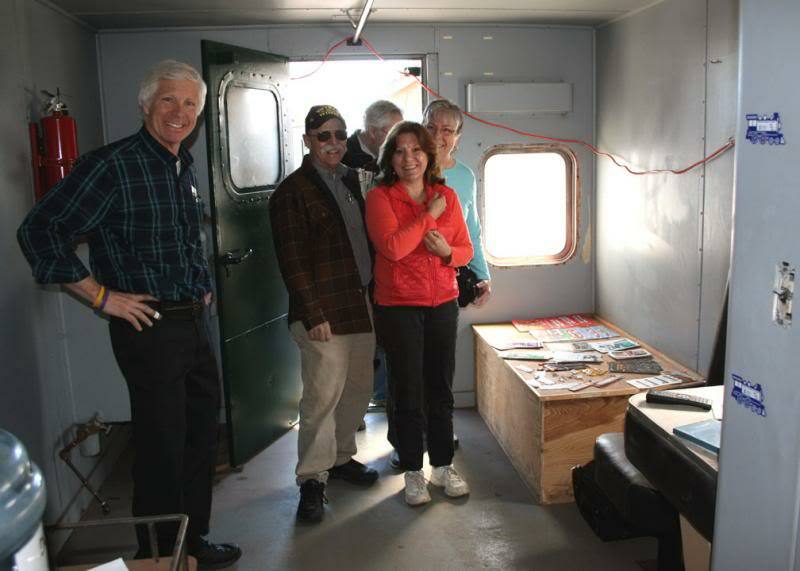 Maine Operation Lifesaver presented their information as visitors toured the caboose. At 11:00 AM, Darling's Auto Group arrived with their ice cream truck. The announcement of "Free ice cream!" simply added to the enjoyment for everyone. There is no doubt that children love trains, as do their parents and grandparents. Children explained to moms the difference between each type of car, but watching small faces beam while sitting at the throttle of the historic locomotive had to be the kicker for everyone involved. Structured access to "real trains" was complimented repeatedly. Ice cream only made it better. Six donation jugs were placed in the train and each was generously stuffed with bills, coins and checks. Over $2,000 was collected to purchase, move, and restore Maine Central #470. Old railroaders were especially moved by the effort, offering stories and thanks repeatedly. One visitor, singer-songwriter Lenny, presented NESCo with two copies of his CD, Steam Whistle Chaunticleer, with original music dedicated to the steam locomotive legacy, and one in particular, about "The Fate of 470". Said the author, "I wrote it before you people came forward to save her. Had I waited, I could have added a happier ending!" Touch-A-Train Event #1 brings our donation and earnings level close to $25,000. Moving the locomotive will require additional funding. Touch-A-Train Event #2 will be held in Ellsworth, at Washington Junction, on June 21st. Hosted by the Downeast Scenic Railroad, the venue will be different as will the equipment. 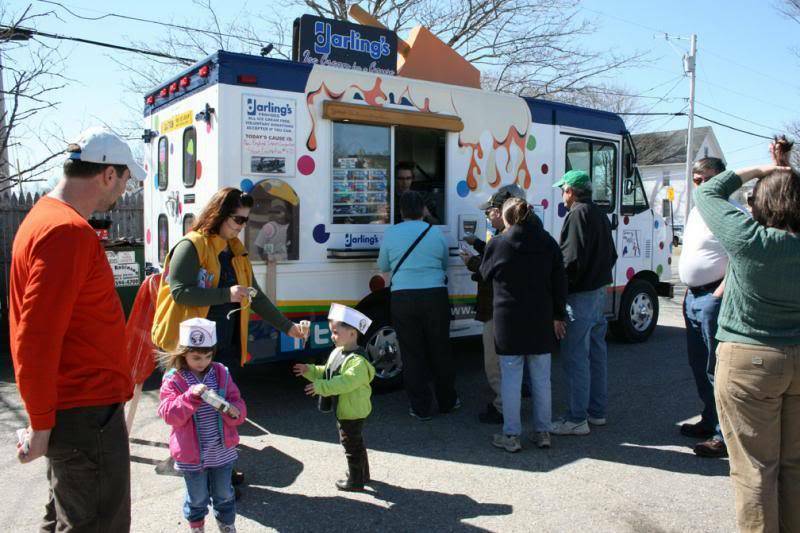 The Darlings Ice Cream Truck will be present once again, and other surprises are in development. Do you have a display with which to share and entertain visitors at the Downeast Scenic? Does your business want to get behind the restoration of "The Mascot of Maine" with sales, "give-aways," or vending at the site? Please let us know by emailing newenglandsteamcorp@gmail.com. Your donation is tax deductible and will make a huge difference in children's faces for decades to come. Remember, every dollar earned goes directly into Maine Central #470. As a participant, visitor, or donor, we are preserving Maine's railroad heritage.